Our culture is very ‘self-focused’. We are encouraged to ‘look out for #1’, to ‘get what you have coming to you’, to ‘stand up for yourself’. Our culture, our world says ‘This is ‘Living’! In fact, even in churches,’self’ has become dominant. We look for churches that make us feel good…we demand that teachers teach things that make us feel comfortable…we want the worship music to make us feel all warm and toasty. Even from some pulpits, we hear ‘self’ as #1. We’ve taken that…Love God, Love Your Neighbor…the clear focus of Jesus’ words, and made them subordinate to ‘as yourself’–the assumption of what we normally do (without prompting). But we just can’t do that. If we are going to ‘follow Jesus’, we need to live as He’s called us to live, and clearly, that means (among other things) to ‘self-sacrifice’. Mark 9: 33-35: “They came to Capernaum. When he was in the house, he asked them, “What were you arguing about on the road?” 34 But they kept quiet because on the way they had argued about who was the greatest. Following Jesus–becoming a Christian…is not just about what you do with your Sunday mornings, nor is it only about ‘not doing’ certain things that are ‘outside the lines’ of Scriptural commands and principles. Following Jesus also means that we LIVE for Him, by allowing Him to make us more like Himself…and one of the keys to that is to embrace Self-Sacrificial love! It shows up in many ways–small and large, and it is never ‘easy’, but it is absolutely crucial for a person who wants to really ‘worship’ Jesus as Savior and Lord! Truthfully, I ‘get’ that this world is selfish…and it’s not going to change. However, as Believers in Jesus, and members of His body–the Church–we need to live differently. We need to give up ‘self’ and focus on Loving God, and Loving our Neighbor. For the Believer, THIS is ‘living’! As I’ve written, our world is in a bit of turmoil, with no sign of it getting better. In fact, it may even get worse! Well, as I’ve written recently, the first thing to do is to go to God and submit to Him, repenting of our sins and lifestyle choices which have chased Him away, and caused Him to remove His blessing and protection, and may be earning His discipline. The next crucial step, if you have not already done so, is to accept and acknowledge Jesus as Lord and Savior, giving your life and eternity to Him, by faith. For those who have already done so, then there was yesterday’s post–WORSHIP! This assumes that God is on His throne, He is working out an eternal plan which is simultaneously ‘for His glory’ and ‘for our good’. Therefore, I can trust, follow…and worship Him. I would suggest that all of these points are preparation for the role that He wants us to play. It’s like we’ve been packing for a trip–all of these steps have been important items to take, and have made us ready. We are now prepared to join Him in His work…to be His hands, His feet, His voice to this world, which has lost it’s way and is blindly trying to come up with it’s own solutions. For the follower of Jesus, who is faithfully trying to trust God, submit to Him and to love Him, now we need to ‘Go’, and ‘Shine’. Our main job–after connecting with and worshiping Him–is to ‘spread the news’. After all, He is THE ‘Savior and Lord’ of all the earth, and we need to let those that we come across know it. He loves each and every one on this earth, and wants us all to come to know Him…but how will they know unless we tell them? As we move out…and ‘Go’ in His name, we need to remember to SHINE! Jesus said, “You are the salt of the earth. But if the salt loses its saltiness, how can it be made salty again? It is no longer good for anything, except to be thrown out and trampled underfoot. He wants us to ‘Light it up’! He wants us to live in such a way as to shine! Not shining our own light, but shining HIS light. Shining the light as He (based on His word) would have us do. That means practically demonstrating His love, His grace, His mercy and forgiveness. Volunteering in Hurricane Relief efforts…helping at your neighborhood school…serving at your local Mission…befriending a neighbor or coworker…giving your time, talent, and treasure to causes and ministries which reflect His love and direct to the Life that He offers. It really means investing ourselves in self-sacrificial ways into the lives of other people. Yes, there are some who ‘lose the connection’ with Jesus, and they end up doing a lot of temporary good…but no eternal good. I think He wants us to do both…to love others while pointing them to Him. Think about this: None of us know ‘the end’. We don’t know our own personal end, nor do we know the ‘end time’ for this world, for sure. Yet, we do know what He wants us doing. We do know how He wants us to live. We do know what we can do to make the biggest ‘eternal’ impact. It’s as if we’re running a race, He wants us to ‘run through the tape’…in other words, to finish strong! For a Christian, ‘finishing strong’ means trusting Him, worshiping Him, and serving Him, as we ‘Shine His Light’ to this world. Is God trying to get our attention–either by sending these calamities, or by removing His protection and ‘allowing’ them? It will be no surprise to you that I think that the third answer is the ‘correct’ one, and I invite you to read the last few blogs to find out why. The immediate personal response is what I wrote about in the last couple of days…but what are we to do, moving forward? Whether these tumultuous events continue, or whether we go into a period of relative calm, how are we to ‘Move On’? I believe that the best way to respond is in WORSHIP. That’s right–worship–‘to revere, respect or admire a ‘divine being’; to devote oneself to something or someone’. I believe that the only appropriate response to all this is to worship the Lord more fully and completely. ‘How’, you might ask, ‘does that change anything or help with any of these calamities’? First, to really ‘worship’ the Lord means embracing the calling to take our focus off of our trials and tribulations, and lift our eyes above them–to the One eternal God. It means we need to keep things in perspective. Our trials–overwhelming and painful as they may seem–are temporary. Even if they last us for the rest of our lives, that is ‘temporary’. Eternity is longer! Obviously, this requires faith…it takes faith to believe in eternity…life after death…a God who is ‘above it all’. It also takes trust–Trust in that God, who is wise (wiser than we are), who is loving (therefore, is working for our good and His glory…no matter what), and a God who is powerful enough to use all of this world’s circumstances and to ‘redeem’ them, using them for His eternal purposes. What is His purpose? His glory and our eternal good. We have to remember–by faith–that He is using every circumstance–Hurricane, Typhoon, Earthquake, Drought, Wildfire, Mudslide, Sunspot–everything we’d call ‘natural disaster’–for His purposes. We also have to remember–by faith–that He is using every trial–at work, in our marriage, with our money, in our health–every thing we think of as a ‘personal trial’–for His purposes. ..and this requires that we trust His purposes. This is where many people go wrong…and it’s due to their ‘spiritual eyesight’. Many people look at their circumstances in the foreground, with God behind those circumstances in the background, partially obstructed by those very circumstances. They wonder, naturally, why God seems small and powerless compared to those circumstances. I believe that faith–transformative, Spirit-empowered faith–enables us to look at God in the foreground, so that our circumstances are in the background, seen through the grid of our faith and trust in Him. When we do that, then we can trust Him over the circumstances. That is why, I believe that the BEST response–with all that in mind–is to worship. Take my focus off of myself, off of my circumstances, and off of my temporary situation…and focus instead on the One True God, who is eternal, immortal, wise, loving, powerful, kind, and good. As I do that, I then find the strength–by faith–with the correct perspective, to then deal more fully with the current reality–whether that be rebuilding my home or rebuilding my marriage, overcoming tragedy or overcoming trial. Worship the Lord! Keep your eyes on Him, and gain strength to overcome! Very few events are more powerful and moving than a beautiful wedding. That moment when the groom, the groomsmen, the bridesmaids, the Minister, and all are in position and ready. They turn and look to the back of the church. The music changes…the bride’s parents stand…all in attendance stand…and they look back in anticipation. The doors open, and The Bride enters, with her father! Dressed in white, hair done ‘just right’, flowers in hand, beaming and ready for The Moment! All are breathless as they watch her. Some smile, some are brought to tears…all celebrate The Bride, especially as she arrives at the front to take the hand of The Groom. Weddings are truly beautiful events. …but anyone who has been involved in one knows that the preparation for it has been enormous. For many couples, the preparation for the wedding can be intense and stressful. All of the work that this Bride put into the preparation is important to her. She wants the event to be ‘just right’. She’s dreamed of this day. She’s looked forward to it. She wants it to be just right–for The Groom! In the Scriptures, the Church of Jesus Christ–those who are Believers in Him, and who acknowledge Him as Savior and Lord–are His ‘Bride’. …and this is the time of our preparation. 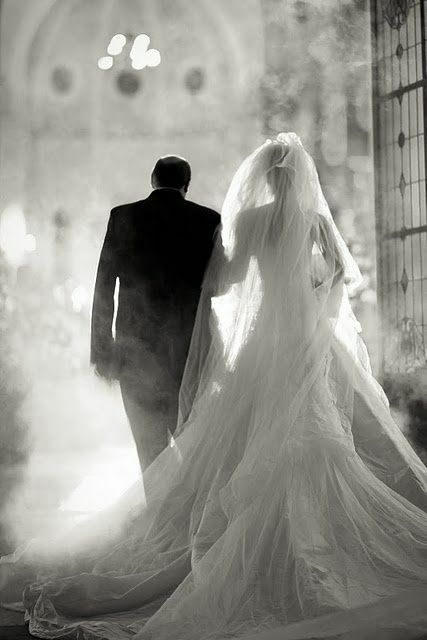 There will be a time when Jesus (The Groom) will come for His Church (The Bride), and there will be a celebration! What has The Bride done to “make herself ready”? She has prayed. She has worshiped. She has rid herself of all the junk that would hold not be appropriate for the wedding. She has endured opposition, persecution, and even death! Imagine if that moment happened…the doors opened..and the bride showed up with mud all over her dress, her hair a mess, and boots on! What a tragic mess that would be! That bride needs to be ready! Yet, some of us will not be. “Then the Kingdom of Heaven will be like ten bridesmaids[a] who took their lamps and went to meet the bridegroom. 2 Five of them were foolish, and five were wise. 3 The five who were foolish didn’t take enough olive oil for their lamps, 4 but the other five were wise enough to take along extra oil. 5 When the bridegroom was delayed, they all became drowsy and fell asleep. Jesus says that we (the bridesmaids) need to “Keep watch”! We need to be ready! What can we do to ‘get ready’? The Bride must be ready! Don’t waste any more time! Prepare, Watch, and Pray! 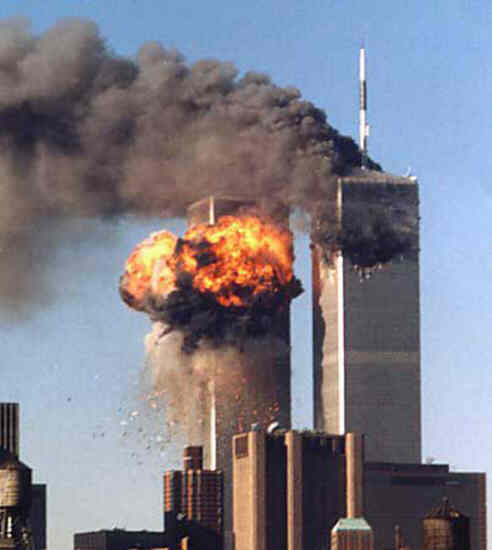 I heard on the radio on my way to the office that a plane had hit the World Trade Center in New York. ‘What a tragedy’, I thought, ‘I hope there weren’t many people involved’ (the initial radio report was that a “small plane” had hit). Terrible accident. “I know”, I said, “We were just praying for them”. At that moment, everything changed. We knew we were under attack. If you’re old enough, you remember the rest of that day…in some ways, a blur…but specific details stand out. I do remember getting several calls within the next hours from people asking us we we Pastors thought this was the beginning of WW III, and could this be the beginning of the end. At first, I almost chuckled at that…but then I realized that people were really worried about it, and I needed to answer them in an educated, compassionate way. “Don’t let anyone mislead you, 6 for many will come in my name, claiming, ‘I am the Messiah.’[a] They will deceive many. 7 And you will hear of wars and threats of wars, but don’t panic. Yes, these things must take place, but the end won’t follow immediately. 8 Nation will go to war against nation, and kingdom against kingdom. There will be earthquakes in many parts of the world, as well as famines. But this is only the first of the birth pains, with more to come. These, Jesus said, are the beginnings of the birth pains. These are to get our attention, and lead us to repentance and worship. They are for our good! That’s why Jesus calls them ‘Birth pains’…like contractions which lead to birth. However, we don’t know exactly how long they will last. Obviously, we can’t know ‘for sure’. However, I think they may be. We should ‘prepare’ as if His return is immanent, because it is! He could come back any day! …and this isn’t just your typical ‘live each day like it’s your last’ slogan…I’m talking about taking an active posture of readiness for His return. Jesus continued, “However, no one knows the day or hour when these things will happen, not even the angels in heaven or the Son himself. Only the Father knows. 33 And since you don’t know when that time will come, be on guard! Stay alert!” (Mark 13:32-33). “Since everything around us is going to be destroyed like this, what holy and godly lives you should live, 12 looking forward to the day of God and hurrying it along. On that day, he will set the heavens on fire, and the elements will melt away in the flames. 13 But we are looking forward to the new heavens and new earth he has promised, a world filled with God’s righteousness. Peter (and Jesus) say that it does matter how we live–if we are to be ‘ready’ and ‘alert’. So, Christian: Are you paying attention? Are you watching, praying and ready? Are you repenting for any sin in your life, and making the changes necessary to worship Him fully–not just in word, but in lifestyle? Are you sharing the good news of the LIFE that is offered, through Jesus, to others? 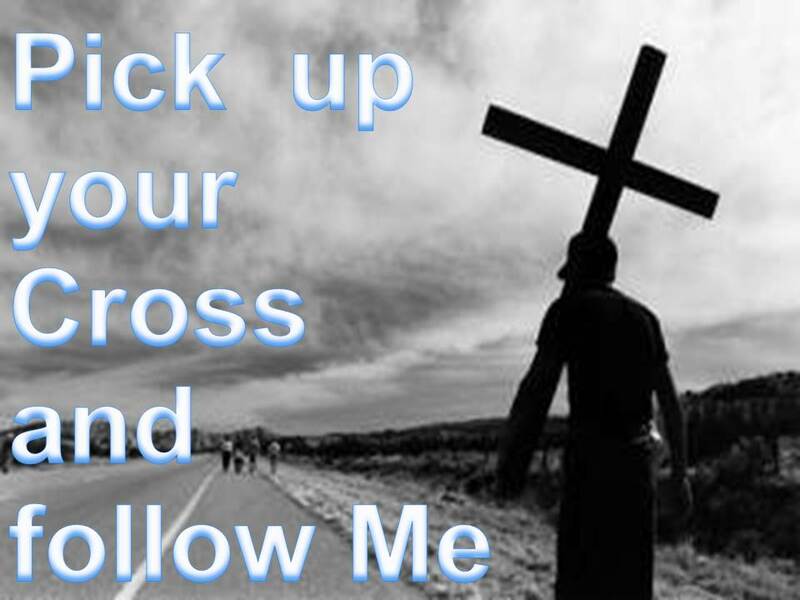 For those of you who are not Christians, let me ask you: What will it take? What do you have to see happen before you begin to realize that you’re not ready? More trouble? 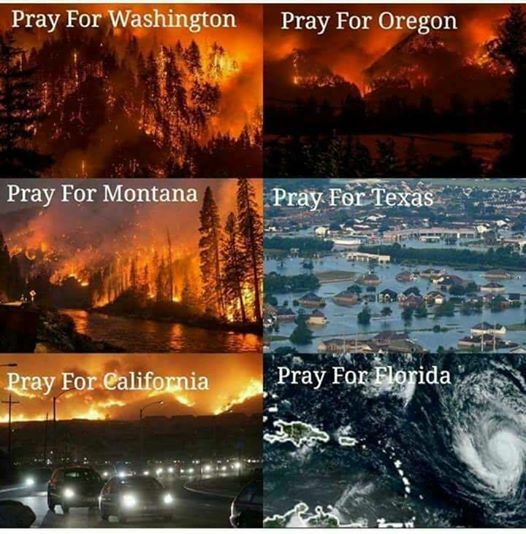 More natural disasters? More ‘shaking of the earth’ and ‘signs in the heavens’? I would encourage you to start to pray and ask Jesus to show you Himself, so that you can know…then turn to Him in faith and be saved from whatever the future holds! The great news is that God loves you and wants to save you! Drop your guard and let Him! Hurricane Harvey devastated large portions of Texas and Louisiana, and now Irma is getting ready to pummel Florida, after battering the Caribbean (now Hurricane Jose is up to a Category 4, following right behind Irma, but hopefully turning out to sea). In addition to that, wildfires (which haven’t received nearly as much coverage) are burning at record rates across the west, from California to Oregon and Montana, have burned over 1.4 MILLION Acres! Now we hear of major solar storms, we see that Mexico has suffered a major earthquake on the Pacific side, and Hurricane Katia is headed to the Gulf side. Nothing to see here. The person who takes this approach says it’s the same as it’s always been, nothing new, we just have technology to know about it now and see it 24/7 on our t.v.’s. This person will continue on his/her merry way…as long as nothing happens near them. Climate Change is happening quickly! This person looks at these events and says, ‘See?! We’ve been saying for years that mankind has changed our climate and now we’ve finally seeing it! What we need to do is get rid of all greenhouse gases, and stop giving people the choice–everyone must join this!’ That person looks for the governments of the world to unite and require the people of the world to ‘get in line’ because the ‘only hope’ is a man-made solution. God is behind this. This person sees the ‘shaking of the earth, the heavens and the climate and sees God behind it…maybe in judgment, maybe in love…but He’s definitely doing something. If #3 were the case, and it was on a global scale, as we’ve been seeing, we’d expect to see something in the Scriptures to back that up. Beginning? More to come? Whoa! “And when you hear of wars and insurrections, don’t panic. Yes, these things must take place first, but the end won’t follow immediately.” 10 Then he added, “Nation will go to war against nation, and kingdom against kingdom. 11 There will be great earthquakes, and there will be famines and plagues in many lands, and there will be terrifying things and great miraculous signs from heaven. 12 “But before all this occurs, there will be a time of great persecution. You will be dragged into synagogues and prisons, and you will stand trial before kings and governors because you are my followers. 13 But this will be your opportunity to tell them about me. [c] 14 So don’t worry in advance about how to answer the charges against you, 15 for I will give you the right words and such wisdom that none of your opponents will be able to reply or refute you! 16 Even those closest to you—your parents, brothers, relatives, and friends—will betray you. They will even kill some of you. 17 And everyone will hate you because you are my followers. 18 But not a hair of your head will perish! 19 By standing firm, you will win your souls. Now, again…some will say ‘those things have always been here…nothing is new here’. …and THIS is the point! It is my conviction that God is using all of these events–in unison–to bring us to humble ourselves and repent! He is extending his hand of love to us, not wanting any to perish, but all to come to repentance and LIFE, in Jesus! We have taken Him for granted, then ignored Him, then claimed He was dead, then defied Him…our nations are like the people in Babel (Genesis 11), thinking we have all the answers, ourselves. ‘We don’t need God, we don’t want God. We can do it ourselves’ has been the mindset of our age. I believe that this has caused Him to remove His hand of protection, and we’re reaping what we’ve sown. I hope not…but I think so. For those of you who are skeptical, let me ask you: What would it take for you to pay attention? What would have to happen in order for you to think ‘there may be something to this’? Earthquakes in unusual places? Something happen to our water sources? Military actions? Terrorism? Wouldn’t it be better now to humble ourselves and repent? After all, what are we resisting? The loving care and direction of God our Creator! Life…to the Full, in Jesus the Christ! I continually pray for protection. I pray that God moves these storms and intervenes to break them up. I pray that the calamities cease. Yet, I also pray that my friends and neighbors, my countrymen and the citizens of this world will repent of their stubborn pride, their sin, and receive forgiveness and LIFE, through Jesus! If you’re already a believer, join me in praying for that, and make sure that you are repenting of your own stubbornness, pride, sin…and that you are loving Him and worshiping Him and seeking Him more…as I am! God wants to love us…let’s let Him!